The sad news on Charles Aznavour’s demise came as a big shock to many across the globe, seeming to kind of stop the planet Earth from spinning, bringing an inconsolable grief to hundreds and millions of people, Prime Minister Nikol Pashinyan said in his euology honoring the great singer and composer. “That name engraved smiles on millions of faces for eight decades, injecting sparkle in hundreds and millions of eyes. And that name stopped, for a moment, planet Earth from moving, and the course of international developments on October 1 2018, bringing an inconsolable mournfulness to hundreds and millions,” he said. Pashinyan left for Paris on Friday to attend the ceremony of paying homage to the legendary musician. The event, held at Les Invalides in Paris on Friday, was attended by French President Emmanuel Macron (who also delivered a eulogy), government ministers, parliamentarians, and diplomats. The son of Armenian parents who had narrowly escaped the Genocide, Aznavour was destined to become the Great Chansionner, Pashinyan added. “His voice spread across the world, reaching the remotest countries to warm even the coolest hearts. “Regrettably, I didn’t manage to get personally familiarized with Charles Aznavour, the great master. But believe me I perceive him as a close relative of mine. That’s virtually how each and every Armenian perceives him, as Aznavour is the person who raised the Armenian's name to altitudes, imparting a new spirit to the Armenian's pride and a new shade of light enabling him to share his fatherland's pains, troubles and dreams. “This is also why Aznavour was honored with the title of National Hero of Armenia. But he earned that title not only thanks to his genius as a chansioner but also to the incontestable merit that contributed to the accomplishment of the Republic of Armenia. “Streets and squares across Armenia are named after him, with the second largest city of Gyumri being home to his grandiose statue erected several years ago. He is, perhaps, the only person to have a statue honoring him in Armenia while still alive. “We have declared National Mourning in Armenia in connection with Charles Aznavour’s demise. 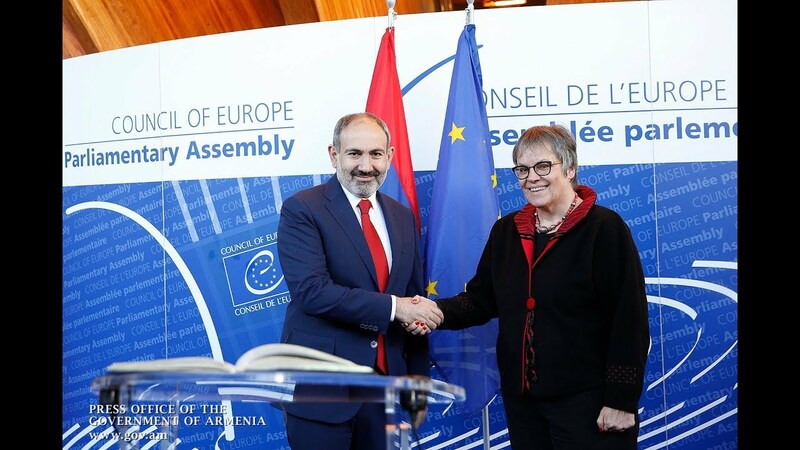 It is the expression of the tremendous love each and every Armenian has for this great person, the great French man and the great world citizen,” Pashinyan said. Pashinyan further lauded Aznavour’s unsparing dedication to his historical fatherland, his assistance to the country and its people, especially after the devastating earthquake thirty years ago, and in the hardest period for the newly independent state in the early 1990s. “Charles Aznavour wasn’t indifferent to the non-violent, velvet and popular revolution in Armenia either,” Pashinyan said, citing the singer’s last letter to him (expressing a great desire to visit “New Armenia” to meet with the vibrant young generation standing at the roots of the new government). “Regrettably, I stopped short of keeping my promise. What comforts me, though, is that Aznavour managed to nonetheless convey his last message to New Armenia,” Pashinyan said, bowing to the memory of the talented artist.